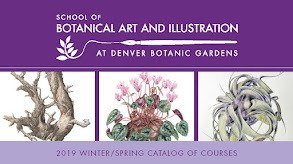 Today 15 enthusiastic Botanical illustration students learned about Coptic binding and how to create a beautiful journal, either for field journaling or for BI-color mixing reference book. Instructor was Annie Reiser. You can see more pictures in the Facebook (if you are not yet with Facebook, create an account and become a fan). 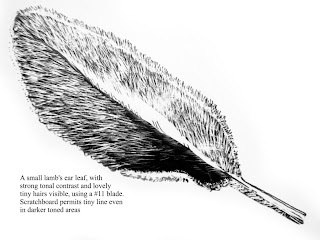 Scratchboard works beautifully with ink, allowing for tiny, exquisite details. 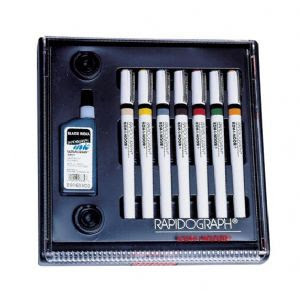 It may also be used with applications of color or graphite, giving the same fine line and total control of tonal values with colored pencil, graphite, watercolor, gouache or ink. Like to try and learn more? We are offering a weekend workshop in February 19-21, 2010, 9 a.m. - 2:30 p.m., for more details and to register, please click here. Using Edible Wild Plants in Cafe Botanique on Thursday! 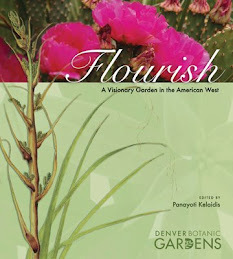 "Using Wild Edible Plants" will highlight the issues that may arise from incorporating wild foods into our daily diet. These issues will be discussed using examples from the edible and toxic flora of western North America, giving insight on the points of wild harvest and the associated risks of toxicity. Brian Elliott has had a life-long interest in plants and ethnobotany. 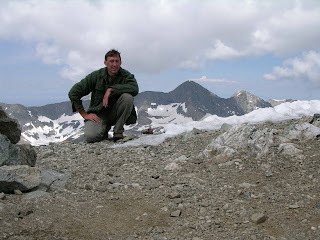 He has worked as a landscaper, nurseryman, native seed collector, botanist for the Forest Service, and is currently a self-employed botanical consultant focusing on rare plant conservation in the western United States. 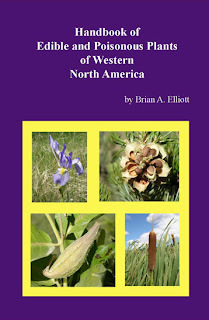 In 2009, he published his first book, the Handbook of Edible and Poisonous Plants of Western North America. Brian will be signing his book after his presentation. Society for Range Management and Weed Science Society of America will arrange a joint annual meeting on February 7-11, 2010 in Sheraton Denver Downtown Hotel: Working Landscapes - Providing for the Future. In conjunction with this meeting a one-day long Symposium: Science & Management for Open Space Grasslands is held on Thursday, February 11th. The morning topics for this symposium include ecological issues like ecological processes, role of ecological disturbance in grasslands, influence of fire and grazing on grasslands while more of management matters are discussed during the afternoon (e.g., integrating cultural values into management). Further information and registration is available on-line. The logo for the meeting was created by Barbara East, renowned western artist. Please read her interpretation for the artwork and view the interpretive tour here. Barbara East belongs to DBG's BI-community. 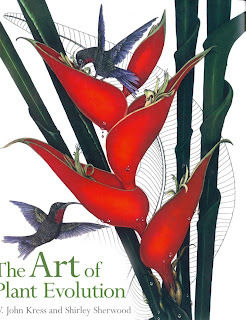 Art meets the science of plant evolution in this ground breaking, beautiful book. 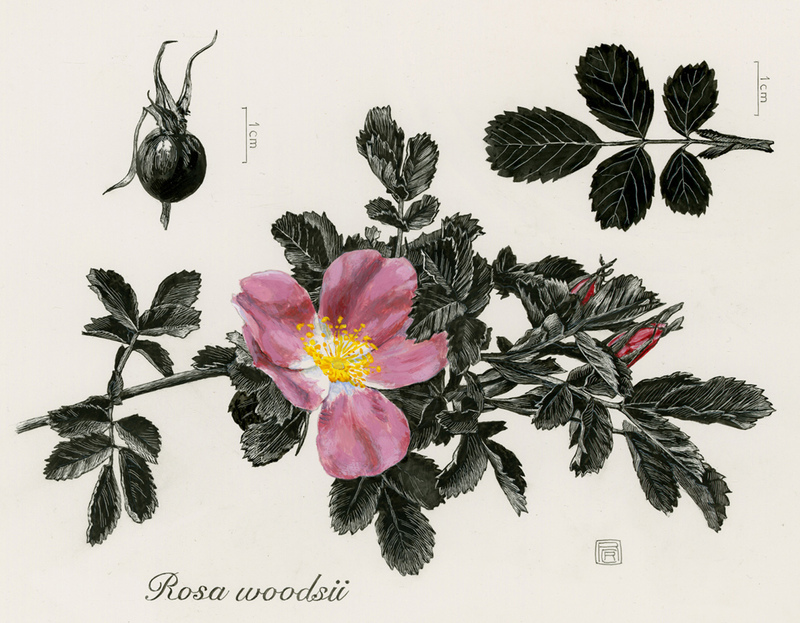 In this publication the principal goals of both disciplines are successfully brought together through Botanical Illustration to celebrate the 150th anniversary of the publication of Charles Darwin's On the Origin of Species. 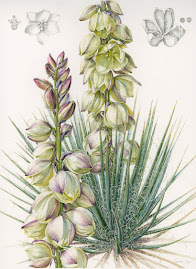 The botanist's ambition to classify and name species and the artists desire to capture the essence of nature through color and composition are effectively combined confirming how both disciplines are complementing each other and dependant on each other. The 136 paintings from the Shirley Sherwood Collection are taxonomically arranged in a evolutionary sequence making this book a treasure. 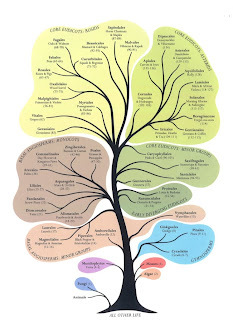 The book also includes the latest molecular details from the DNA research. The authors are Dr. W. John Kress from the Smithsonian's National Museum of Natural History and Dr. Shirley Sherwood. 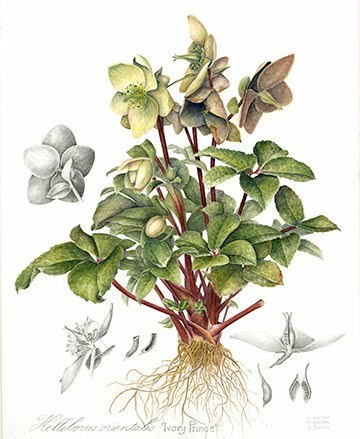 It is published by and available from the Kew. One-day workshop on Saturday, January 30th will introduce one of the earliest known, multi-sectioned, unsupported sewn structures for bookbinding. Coptic binding was developed in the4th century A.D. in Egypt. The chain stitch used to attach signatures to each other had its roots in carpet weaving. Contemporary bookbinders often refer to any non-adhesive bookbinding in which unsupported stitching across the signatures is laced directly into the covers as a "Coptic Binding". The spine of a Coptic book is particularly attractive and you can open the book to a full 360 degrees or lay it completely flat without risk of damage to the spine. 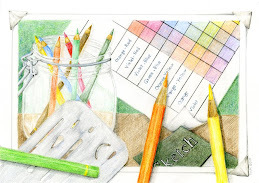 On this class, instructed by Annie Reiser, you can make either a travel/field journal or a special journal tailored for our color mixing class. We do it with four needle Coptic sewn and for the paper we use Arches 90 lbs. hot press watercolor paper. To register for the class, please call 720-865-3580 or register on-line. 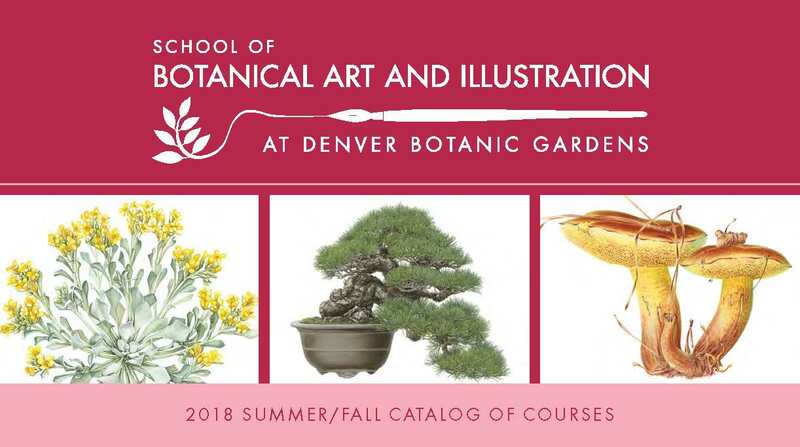 The National Guild of Bookworkers gives you more information about the book arts; in Colorado we have The American Academy of Bookbinding in Telluride. 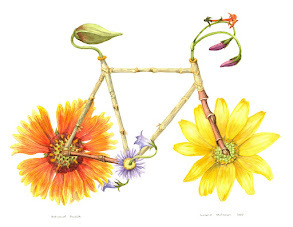 The jurors have spoken: Ann Swan, Leslee Elkan, Stephanie Schrader and Susan Panjabi have selected 33 illustrations to be displayed in the 2010 BI-Anniversary Show. 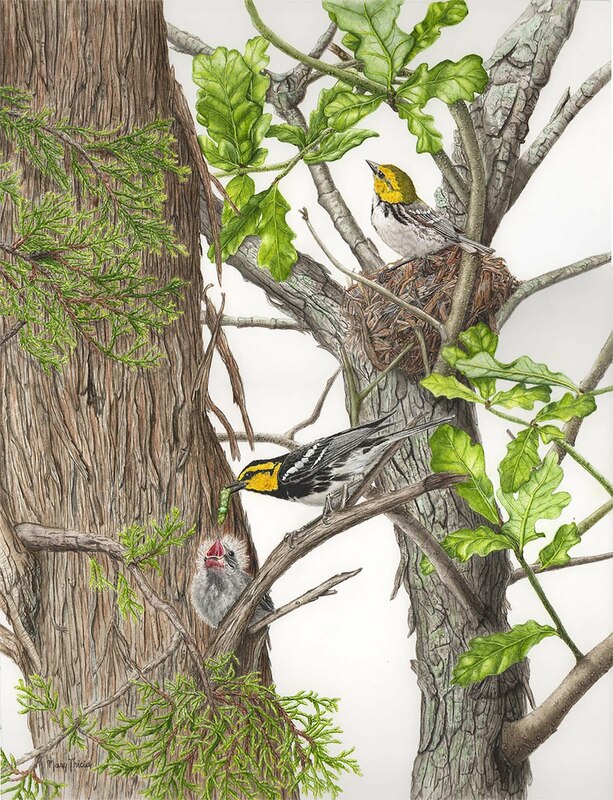 The selected artists are: Jan Boyd Haring, Cathy Cridlebauch, Karen Cleaver, Marjorie Leggitt, Estelle Deridder, Teresa Burkert, Constance Sayas, Susan Rubin, Jan Boyd Haring, Libby Kyer, Karla Beatty, Ann Fleming, Michael Campbell, Patty Whalen, Madonna Guenthner, Hannah Rottman, Renee Jorgensen, Susan Olsson, Suzanne Wuerthele, Jill Moring, Sheila Payne, Kaye Hurtt, Mervi Hjelmroos-Koski, Katherine McCrery, Mary Clark, Annie Reiser, Julie Sprinkle, Laura Farnsworth and Susan Dimarchi. 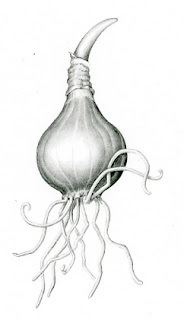 Renaldo Kuhler is a scientific illustrator with a lifelong project: his own nation, Roccaterania. With the same detail he uses to record the scale patterns of snakes or the curves of microscopic bones, he has designed an alphabet, fashion, architecture, movie industry, and all the other possible details of his imaginary country. 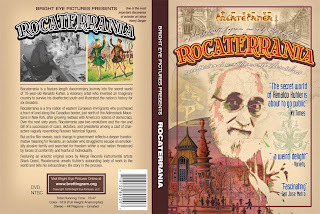 Rocaterrania is a feature-length documentary journey into the secret world of 76-year-old Kuhler, a visionary artist who invented an imaginary country to survive his disaffected youth, and illustrated the nation’s history for six decades. Formerly a journalist, physics teacher and electrical engineer on the Space Shuttle Main Engine Program, Brett Ingram has been making films since 1990. His short documentaries and animated films have screened at more than 150 festivals, winning 30 awards collectively. Nicholas Culpeper, the famous botanist who lived during the 17th century England, made herb growing very fashionable in his area. 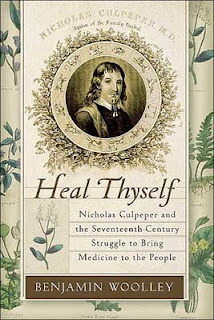 Culpeper spent the greater part of his life in the English outdoors cataloguing hundreds of beautiful plants that also hold medicinal properties. 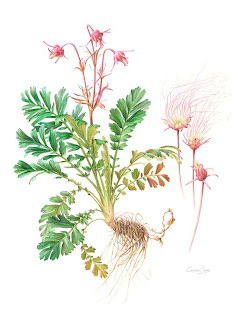 Come and learn about Culpeper's Herbal which remains a resource for today's practitioners of herbal medicine, and create a portrait of an herb plant in watercolor. 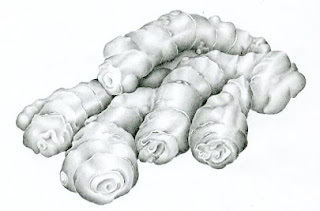 For more information about this Botanical illustration course, please click here. 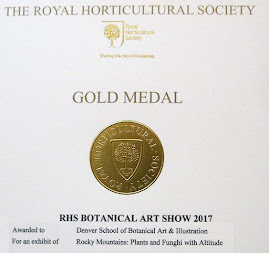 For members of RMSBA, this is an opportunity to create work for the upcoming juried exhibit, "Culpeper's Medicinal Herbs"
This class will begin on Friday, January 15th and there are still some free seats available, pelase register here or call 720-865-3580. Ready for Pen and Ink practice! We have a Koh-I-Noor Rapidograph 7-pen set for sale at $50. It is slightly used and professionally cleaned by our calligraphy/pen and ink teacher. Set includes hinged case with ink and nib keys plus seven technical pens with hard-chrome stainless steel drawing points in seven line widths: .25mm,.30mm, .35mm, .50mm, .60mm, .80mm and 1.2 mm. If you are interested, please contact Mervi. 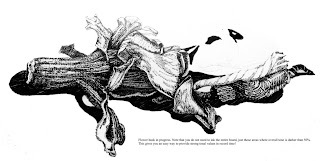 Explore the plant parts you usually cannot see, those hidden beneath the soil surface. 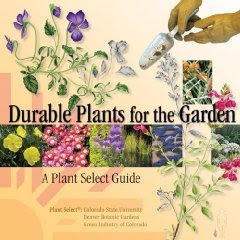 Flowering bulbs, vegetables, and even houseplants reveal intriguing characteristics under the soil. 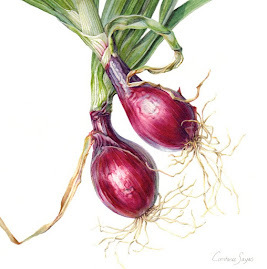 Using a range of pencils from 6H to 6B, learn how to render the fine hairs, smooth and rough textures, and rounded forms of roots and bulbs.